We ended the last episode when Izetta arrived to the place, where Sophie was waiting for her and from where the missile should be launched towards Landsbruck. They have number advantage and start to fire all they get towards Izetta, but she has her trusted lances strengthen by magic to aid her. In the meantime in Albringen soldiers are running towards the barrier, where they stopped Finé with others. The situation looks dire, so they decide to rush through the barrier into the city. Everybody is trying to stop that car. When truck blocks their path, they decide to jump off the car and run into the streets. In that moment Berckmann escapes, they let him go. He ends up on small boat under some bridge fishing package which contains his passport and some other stuff. Basler finds him. He is still disappointed that Berckmann decided to betray his country when a lot of his brothers-in-arms died for it and even reminding him the death of Ricelt, who died because he believed in Berckmann. After that Basler shoots. Finé with Bianca and Sieg are sneaking through the city to get to the conference, which already started. There Germanian ambassador shows the Empire enemies film from missile test. They don’t believe him as he expected - so he reveals the true meaning of this conference - to show them the true power of the missile, which will be launched to destroy Landsbruck and whole Eylstadt. To get past the guards, Sieg decides to distract them to allow Finé and Bianca to sneak into the place where the conference is hold. Soldiers pursuit Sieg. He comes across young Germanian soldier, who reminds him Jonas. He cannot force himself to shoot another boy and is killed by an unnamed Germanian soldier. This gave the opportunity to Finé and Bianca to get to the conference building and when the Germanian ambasador says that the enemies of Germanian Empire does not have any other way than to surrender, they appear there. Finé tells them that in that very instance her witch Izetta, who got the same power as Germanian witch, is battling with Sophie. They cannot sign anything until this battle is over. Germanian ambassador verbally attacks Finé, threatens her to imprison her, since she was not invited, but the allies standing behind her as she is one of the concerned parties, which should attend this conference. That’s when Mr. Stanley from United States of Atlanta jumps into the discussion. They are hesitant about the whole witch powers and that it’s the only reason why their forces remain in the Britannia. Even if Izetta wins the battle and defeat Sophie, Eylstadt will be the only country, which will posses the technology of magic. And then if they will decide to have same ambitions as Germanian Empire in the future, there will be nobody to stop them. Finé confirms with Stanley, that they will decide to help Europe and attack if this concern will fade away. We are now returning back to the battlefield. People in the command centre are surprised that after what they fired at Izetta, she is unharmed. Sophie is happy, now she has the chance to fight her. When they are exchanging blows Izetta sees the missile. She is trying to approach it to destroy it, but every try is interrupted by Sophie. That time she remembers the Berckmann’s words - Sophie has to be there in order to assist with the launch. Izetta is pretending to flee just to lure Sophie away from the missile. And the plan succeed. They fly over the Europe, just to end up and fight in the sky over Paris. Sadly for Izetta, they were prepared for this situation. In the command centre they have Sophie’s clone with the Hexenium in her chest - as soon as she wakes up, she will be able to launch the missile even though Sophie is not there. Sophie cannot understand, why Izetta is fighting so hard for the country and for Finé. We are revealed another part of her history as she was betrayed by the Matthias - the prince Sophie loved, not by the princess. It was Mathiass’ last command to kill Sophie, because the rumors about witch would soon reach Vatican and Eylstadt would be pronounced as country of heretics. In his life he was able to restrain her, but after his death, who knows what would happen. 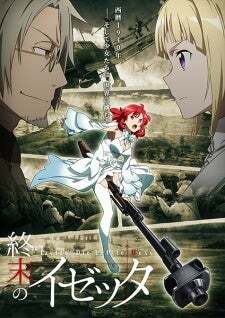 Izetta can’t know how much Sophie suffered, but she understand the difficulty of Mathiass’ decision, because he held the responsibility for every life in the country. This is the same with Finé - Izetta gladly offers her life in exchange to save Finé and everybody in Eylsdtadt. After their battle above Paris, Izetta escapes above the ocean. She starts to gather huge amount of magic energy even though her body is already weakened by using the Magic Stone. Sophie copies her. We can see on the map of ley lines, how they are slowly disappearing. In the same time Finé is explaining everybody the secret behind magic and what is Izetta trying to do. She is gathering every magic energy in the world so in the end it does not matter if she will win or lose, there will be no more magic so even if Sophie survives, she cannot do anything and it will be the end and Izetta will be the very last witch in the world. Slowly the ley lines are fading from the world, Hexenium in the Sophie’s clones, prepared bombs and missile are slowly disappearing. After every bit of magical energy is stored in the huge Hexenium above Sophie’s and Izetta’s head, they collide and the explosion releases huge pillar of light towards the sky. Everybody in Europe can see the last act of magic in world. After that the situation changed. 3rd March 1941 United States of Atlanta kept their promise and invaded Europe. In the same time Volga Federation violated the non-aggression pact with Germanian Empire and attacked from the East. Slowly the Empire was pushed back and as a result of that in Neu-Berlin on 1st December 1941 the Emperor shot himself and the war ended. After that we find ourselves in New York, where we can see Berckmann handing over a briefcase to somebody (information from Germanian Empire? ), probably in exchange for ability to live there and safe his life. The whole episode ends three years later, when Finé in ordinary cloths is walking through the forest we know from her flashbacks - where she first met Izetta. When she finally reach a house in the woods beside the lake, we can see Lotte taking care of Izetta sitting in the wheel chair. As I said already in the episode pre-talk I loved this episode. I think this was really great way how to end the whole show. Starting with the fate of some main-side characters. I have to admit, that I was wrong with Sieg. I thought until the last episode, that he was somehow spy of Germanian Empire - even though it was not obvious, but he was loyal. It was well made character so it’s pity he had to die, but at least he paid for the sin he made, when he killed Jonas. Berckmann was another interesting person. The briefcase he handed over in United States of Atlanta might be an interesting story line for some spin-off OVA. Now returning back to the main events. When Finé was explaining their plan and when she was crying when the pillar of light appeared I cried with her. There was too much emotions. Maybe the final result and the importance of Izetta’s sacrifice would have higher impact if she died, but personally I’m glad that she lived through it. She was always cheerful and full of life, that I would miss her. Speaking about Izetta - the whole fight with Sophie started quite the same as the last one, fighting with the lances and flying all over the sky, but when they started to through planes, tanks and even whole trains to each other it gave it slightly new vibe. Hexenium bombs they through to each other was additional cherry on top of the fight. Oh, and I cannot forget about the moment, when Izetta threw the top of Eiffel tower on Sophie - that was funny. And finally with the last two minutes by simple explanation closed the whole story - even though they made the choice to end the war four years earlier.